A majority of extremist content remains on YouTube even after removal for violation of the site’s terms and conditions. According to a study released in July by CEP, 60 percent of accounts responsible for uploading videos remained active after posting extremist content. Using a narrow set of 229 previously-identified ISIS terror-related videos, CEP found that over a three-month period no less than 1,348 videos were uploaded via 278 separate accounts, garnering at least 163,000 views. 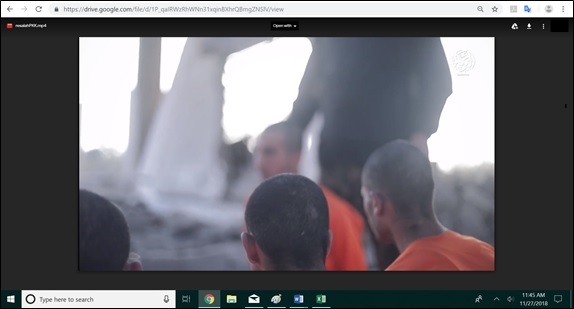 Specifically, CEP found that 91 percent of these ISIS videos were uploaded more than once; 24 percent of terrorist videos included in the study remained online for more than two hours. Further, 76 percent of these ISIS videos remained on YouTube for less than two hours, but managed to receive a total of at least 14,801 views. Not only are YouTube’s existing policies lackluster in preventing extremist content from radicalizing vulnerable individuals, but they are also ineffective. YouTube could be providing fodder for extremist groups to grow their membership and recruit new followers. And these potential new followers could be incited to violence. 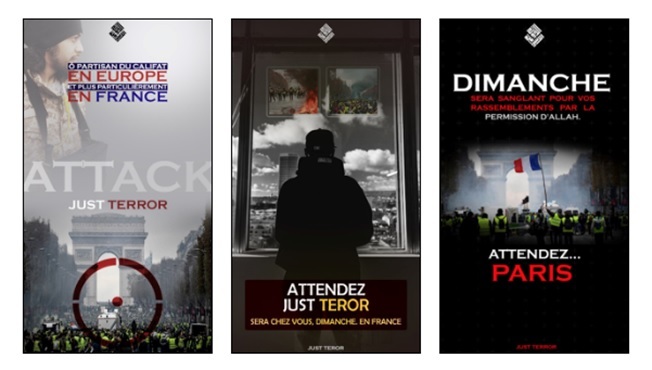 Last week, pro-ISIS Telegram channels posted images encouraging others to commit terrorist attacks in France, specifically Paris, during recent fuel tax protests in that country. The images were labeled “Just Terror,” which is a phrase that has appeared before in similar propaganda images and ISIS media releases. A week before, French law enforcement officers arrested three men, accusing them of “conspiracy to commit a terrorist act” aided by an already imprisoned man. An alleged attack was intended to capitalize on the unrest caused by protests. During raids on the suspects’ domiciles, police discovered pro-ISIS documents, a hunting rifle and ammunition. The alleged plot mirrors ISIS tactics and propaganda. The “Just Terror” propaganda was released after the arrests; however, it strongly suggested the sole purpose was to create fear. Alaji Amin, an Italian resident of Lebanese and Palestinian origin, was arrested in Sardinia by Italian police on November 28. Amin is accused of planning either a biological or chemical attack. Italian media has alleged that Amin was attempting to purchase Methomyl, a highly toxic chemical used as an insecticide. Addtionally, Italian law enforcement revealed that Amin had previously researched ISIS online, as well as ricin and anthrax. Online pro-ISIS groups and Telegram channels have previously made numerous mentions of poisoning and the use of ricin as a terror tactic. At least three notorious pro-ISIS Telegram channels have previously offered technical information regarding the manufacture, handling and use of poisons: “Lethal Dose,” “Lone Mujahid,” and the “Al Saqri Foundation for Military Sciences.” “Lethal Dose” and “Lone Mujahid” have also included information on synthesizing ricin. ISIS’s magazine Rumiyah also made references to using poison as a weapon in at least two issues. While none of the aforementioned sources have specifically included information on Methomyl, they have discussed how poisons are considered a possibility for conducting attacks. On November 26, pro-ISIS Telegram channels posted images encouraging terrorist attacks in France, specifically Paris, during recent fuel tax protests in that country. The images were labeled “Just Terror,” a phrase that has previously been used in similar propaganda images and ISIS media releases. It is unclear who made the images; however, they should be considered unofficial pro-ISIS propaganda. French law enforcement officers arrested three men on November 13, accusing them of “conspiracy to commit a terrorist act” aided by an already imprisoned man. French police allege that the attack was intended to take advantage of the unrest caused by the fuel tax protests. During raids on the suspects’ domiciles, police discovered pro-ISIS documents, a hunting rifle and ammunition. The alleged plot fits ISIS tactics and propaganda. ISIS and pro-ISIS elements have frequently encouraged attacks on large public gatherings, including political demonstrations. This was most notably featured in Rumiyah magazine, as well as in material released via the pro-ISIS Al Saqri Foundation for Military Sciences. It is notable that the “Just Terror” propaganda was released after French police made their arrests. It strongly suggests that the images were made to spread fear. Images located on Telegram on Monday, November 26. It is unclear why specifically the threats mention Sunday/Dimanch and it is possible that the images were first released on other channels on Sunday, November 25. Please note that the images show fuel tax protesters wearing the trademark yellow vest. On November 24, ISIS released a new propaganda video from their self-proclaimed Barakah province in Syria titled, “Message to the Families of PKK Prisoners.” The video shows combat between ISIS and Kurdish forces, as well as dead bodies, the capturing of Kurdish prisoners and the execution of a Kurdish prisoner. The video was originally released on November 24 and 25 on at least 25 websites: YouTube, Facebook, Google Drive, Google Photos, pc.cd, Mediafire, Ustream, Vidio, the Microsoft One Drive, 3rbup, top4top.net, the Internet Archive, mail.ru, Dailymotion, file.fm, Mega.nz, nofile.io, ok.ru, Sendvid, Streamable, tune.pk, Vimeo, Amazon Cloud Drive, Dropbox and yadi.sk. Two to three days later on November 27 (depending on the upload day), the video was still available on 12 websites: Facebook, Google Drive, Google Photos, Mediafire, Ustream, Vidio, the Microsoft One Drive, 3rbup, top4top.net, the Internet Archive, file.fm and Streamable.